So you've just spun up one of our new MongoDB deployments and you are ready to go. Before you do that though, we'd like to explain, especially for those of you who are upgrading from MongoDB Classic, the differences and strengths. When you get your MongoDB deployment, it has no databases created in it. Well, almost no databases - there is the admin database but we'll get back to that later so for now ignore it. 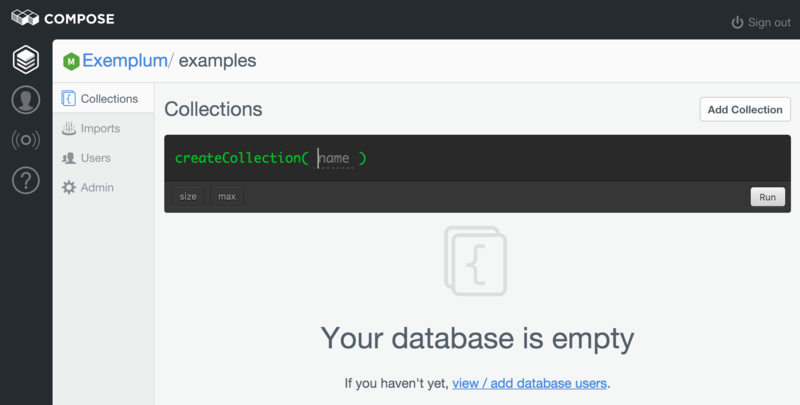 So, like MongoDB Classic, the first thing you need to do is to create a database. That's done through the Browser menu option. Yes, you could create a collection here and carry on, but what we want to do is enable user log ons. For that, you need to click on the "view/add users" link or just click on Users in the menu to get the user screen. Then click Add User to reveal the command line and enter a user name and password into the fields. The only option here is readOnly to make a read-only user. On MongoDB Classic, there was an oplogAccess option, but that's been removed because there's a new way to access oplogs which we'll explain in the next article. 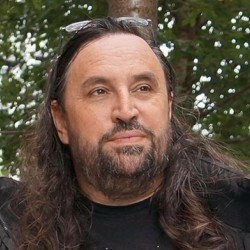 The users that you create here will be owners of this database and have no access to other databases in this deployment. With the ground prepared we can get to connecting. Now then, this assumes you have MongoDB installed locally and that you have a version with SSL enabled. If you have MongoDB installed locally but don't know if it is SSL enabled, run mongo --help and if there's no options beginning with --ssl then you need to get an SSL enabled version of MongoDB to run on your system. If you are using Windows or Linux, you can download the latest from the MongoDB downloads page. If you are on Mac OS X, we recommend that you setup the Homebrew package manager, then run brew install mongodb --with-openssl which will compile and install the latest MongoDB with OpenSSL configured. Once you've done that, you're ready to run the command line... after you've put in the MongoDB username and password you previously added to the database. And at this point you should be logged in to your first database. If you're new to MongoDB, this URI contains two hosts for failover and specifies the database name to connect to at the end (examples) followed by a parameter ?ssl=true to activate SSL. If you're coming from MongoDB classic, this may look similar to a MongoDB Classic URI, but it is actually different. For example, there's no "replicaset" parameter because, although two hosts are listed, they are not two members of a replica set. 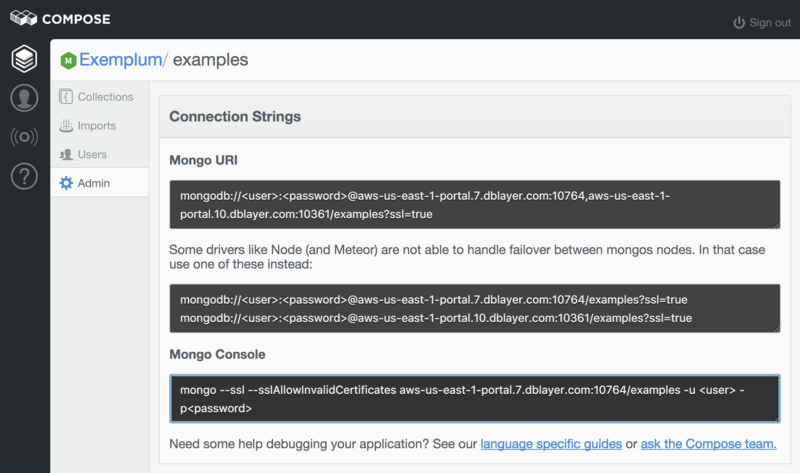 With new MongoDB deployments, you have two Mongos/Haproxy routers to handle your requests. Where drivers can make use of it, this means that the driver and the routers can help manager failover for much better availability. We look forward to drivers and frameworks which are more in sync with MongoDB's URI specification but until then, you have to rely on a single Mongos/Haproxy router. For drivers where this isn't an issue – check your documentation and if it doesn't say, test – you'll get the benefits of two layers of high availability. 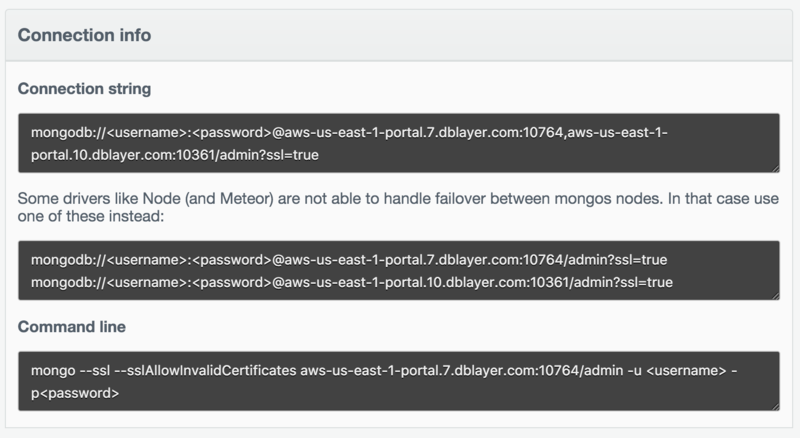 With our new MongoDB deployments, we've opened up the administration controls so you can create MongoDB users with cross-database credentials. To do this, every MongoDB deployment now comes with an admin database already created and an admin user pre-installed. We use the default admin user as part of managing your database. What is important to know is that when you go to the Deployment Overview, the overview and all the information displayed is for an administrator. Specifically, the command line entry is for connecting as an administrator. The user and password here must be created in the admin database. Once logged in though, they will be able to access any other database. You spotted it. Yes, in the command lines that the Compose console shows, for simplicity it uses the --sslAllowInvalidCertificates flag. That's because Compose uses self-signed certificates for our servers and many tools and drivers have a problem with them. They assume there's a certificate authority that will vouch for the certificate and when there isn't, they declare the certificate invalid. So --sslAllowInvalidCertificates says to the mongo command "Do all the usual checking, but don't go looking for a CA to vouch for the certificate". But what if you want to be sure that you are connecting to the server you want to connect to? For that you need to download the public key certificate of your deployment – not database, the certificate is deployment wide – and present that in the command. 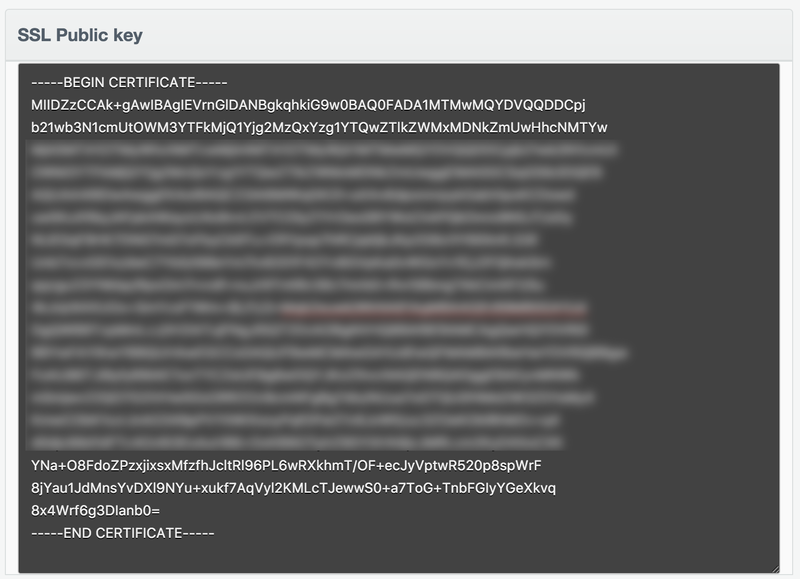 You'll find the certificate on the Deployment Overview page. This text, all of it including the "-----BEGIN..." and "-----END CERTIFICATE-----" lines needs to be cut and pasted into a file on your local system. Let's assume you copy them to a file and save it as compose.cert. That generally works for all the MongoDB command line tools when connecting to Compose deployments. In the next part of this short series, we'll look at why and how to connect to the MongoDB oplog with the new MongoDB deployments at Compose.